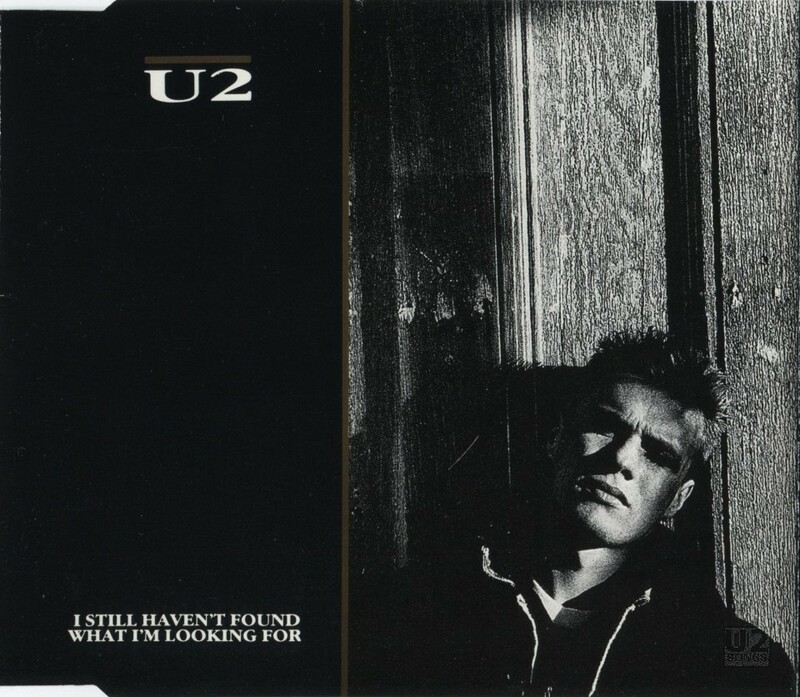 Issued commercially on May 26, 1987 in Europe and May 27 in North America, “I Still Haven’t Found What I’m Looking For” was the second single released from U2’s The Joshua Tree album. “Red Hill Mining Town” had initially been planned as the second single, but Bono had difficulty performing that song during rehearsals and the band was unhappy with the video that had been filmed for it. “I Still Haven’t Found What I’m Looking For” was developed from a demo titled “Weather Girls” and, later, “Under the Weather.” The song was constructed during sessions in Danesmoate in Dublin, based around a tom-tom drum pattern developed by Larry Mullen, Jr. The original “Weather Girls” demo was reworked, retitled “Desert of Our Love,” and included on deluxe versions of the remastered The Joshua Tree release in 2007. The single sleeve was similar in style to that of both The Joshua Tree and the previous single from that album, “With or Without You.” A black-and-white image of Larry Mullen is paired with a black border and gold accents. Like “With or Without You,” an alternate photo, with Larry looking to one side instead of directly at the camera, was used on the cassette single long box in the US. In almost every region, the single featured the same three songs across 7-inch, 12-inch, cassette and CD formats: the album version of “I Still Haven’t Found What I’m Looking For” along with previously unreleased tracks “Spanish Eyes” and “Deep in the Heart.” In Australia and the Philippines, the 7-inch single contained only “Spanish Eyes” instead of both tracks. “Spanish Eyes” was written early on in The Joshua Tree recording sessions at Danesmoate, but was then misplaced. It was found too late to finish for the release of the album. “Deep in the Heart” was originally composed by Bono on the piano, and later reworked by The Edge and Adam Clayton during a studio session that they did not know was being recorded at the time. A video for “I Still Haven’t Found What I’m Looking For,” directed by Barry Devlin and produced by Anne-Louise Kelly, was shot in Las Vegas, Nevada on April 12, 1987, following U2’s concert in that city earlier in the evening. The clip depicts the band members wandering around Fremont Street and interacting with bystanders while the Edge plays an acoustic guitar. The first 45 seconds of footage are presented in black-and-white before the video switches to full-colour and a more “widescreen” feel. As a result of this video, U2 was credited with improving the image of Las Vegas for musicians and opening the city to wider interest among touring musical acts. The video was included on both The Best of 1980-1990 and U218 Videos collections. A video for “Spanish Eyes” was produced, as well. Also directed by Barry Devlin, footage includes live performance clips, shots of Larry Mullen riding a bicycle, Bono driving a pickup truck, and the entire band hitchhiking along with trains, traffic, and other random images of the American desert southwest. That video, along with several others from the album, was incorporated into the MTV documentary “Outside It’s America.” This documentary was included on the DVD accompanying the super deluxe version of The Joshua Tree reissue in 2007. By the time “I Still Haven’t Found What I’m Looking For” was released as a single, The Joshua Tree had become a major hit, and Island Records was eager to capitalize on that success. The label commissioned New York choir director Dennis Bell to record a “gospel” version of the song, with an eye toward releasing it after U2’s version had peaked on the charts. Island Records’ founder, Chris Blackwell, stepped in and put a stop to this plan, suggesting that it would look like a money-grab. In the summer of 1987, while on tour in Europe, Bell had an opportunity to play the recorded gospel demo, featuring a choir known as the New Voices of Freedom, for U2. On September 28, 1987, while in New York for a stop on The Joshua Tree Tour, U2 met with the choir and practiced performing “I Still Haven’t Found What I’m Looking For” with them in a church in Harlem. Those sessions led to a live performance at Madison Square Garden, which would be recorded and later released on the Rattle and Hum album. Video footage of the rehearsals in Harlem would also turn up in the Rattle and Hum film. In concert, “I Still Haven’t Found What I’m Looking For” was performed on every night of The Joshua Tree Tour, as well as every date of the subsequent LoveTown Tour and nearly 70 percent of the shows on The Zoo TV Tour. The song was retired for The Elevation Tour, being played just once over the first two legs of that trek. However, in the wake of the 9/11 attacks on New York, the set list for the third leg was altered, resulting in “I Still Haven’t Found…” being performed at every remaining stop. The song was performed at 70 percent of shows on The Vertigo Tour and almost 90 percent of The U2360° Tour concerts. During 2015’s Innocence and Experience Tour, “I Still Haven’t Found What I’m Looking For” was played at 28% of the concerts, and during one performance of the song, opening night in Vancouver, The Edge missed what he was looking for, and fell off of the stage during the song. The song was performed every night as part of The Joshua Tree 2017 tour. Live performances of the song have been released on a variety of albums, including Live in Paris (Paris, France, July 4, 1987); the previously mentioned Rattle and Hum (New York, September 28, 1987); Love: Live from the Point Depot (Dublin, Ireland, December 31, 1989); “U2.Communication” (Milan, July 2005); U2360 at the Rose Bowl (Los Angeles, October 2009); and the multi-artist compilations The Best of Rock and Roll Hall of Fame + Museum Live (New York, March 14, 2005) and The 25th Anniversary Rock and Roll Hall of Fame Concerts (New York, October 30, 2009). The song was also streamed by U2.com from the band’s June 2011 performance at Glastonbury under the title “U23 – Exclusive Tracks Live from Glastonbury.” Finally, a recording from Johannesburg, South Africa on February 13, 2011 featuring a guest appearance by South African flugelhorn maestro Hugh Masekela, was included on the fan club 2CD live compilation U22. The 22 songs on that album, out of a possible 46 from The U2360° Tour, were selected by popular vote by members of the U2 fan club. “Spanish Eyes” has also been played live over the years, including 13 shows on The Joshua Tree Tour and one each on the Zoo TV, Elevation, U2360, Innocence and Experience, and The Joshua Tree 2017 Tours. It was also among the 46 tracks in consideration for U22, but it did not garner enough votes to make the final track list. It also did not make the cut for the follow up compilation released through the fan club, From the Ground Up, but the performance from San Sebastian, Spain on September 26, 2010 was released as a digital download prior to that fan club gift being delivered. “I Still Haven’t Found What I’m Looking For” was included on both The Best of 1980-1990 and U218 Singles compilations. It was also featured on the “U2 1987 Sampler,” “Special Collection 1980-1987,” and “The U2 Talkie” promotional releases. The song was also included on a multi-artist promotional CD given to attendees of the 2005 induction ceremony of the Rock and Roll Hall of Fame. It can also be found on the soundtrack albums for Killing Bono and Runaway Bride. It was also heard in the movies Blown Away and Bhaji on the Beach, but not included on the soundtrack albums for either film. The song was remixed—with added material recorded by Coco Freeman—and released on the Rhythms Del Mundo album in 2006. Written by U2. Produced by Daniel Lanois and Brian Eno. Recorded by Flood. Additional Engineering by Dave Meegan. Assisted by Pat McCarthy. Mixed by Daniel Lanois and Brian Eno. Written by U2. Produced by U2. Recorded by Flood. Assisted by Pat McCarthy. Mixed by Dave Meegan. DX7 played by Brian Eno. Written by U2. Produced by U2. Recorded by Marc Coleman. Assisted by Pat McCarthy. Mixed by Dave Meegan.